There are many reasons Bill Stewart remains one of the greatest jazz drummers on the planet. His interpretive skills practically are without parallel, his ride cymbal is one of the biggest and most hard-swinging anywhere, and Stewart’s melodic ideas are consistently singular. As a composer, he’s been a work in progress. Earlier albums, like 1995’s Snide Remarks, followed a fairly standard approach, usually a quartet or quintet working the drummer’s adroit post-bop material. Ten records and about 24 years later, Stewart’s honed his writing chops. As on his recordings with organist Larry Goldings and guitarist Peter Bernstein, Band Menu is a trio outing, but sans a chordal instrument. Accompanied by saxophonist Walter Smith III and bassist Larry Grenadier, Stewart offers seven originals, plus one each from Smith and Bill Evans. Freed of a chordal center, the trio devours the bandleader’s cerebral, yet soulful, compositions like galactic navigators, trading jabs through the cosmos. Each song is presented simply upfront, then dissected and elaborated upon with intensity, insight and glee. Stewart’s brilliant drumming is the center, no matter the tune. His touch, stunning ideas and energetic thrust—from insistent rim clicks and foot-pedal-hammered hi-hat accents—are endlessly fascinating. “F U Donald” bounces with blues, and on “Good Goat,” a rapid-fire, Monk-like melody scorches the air like a heatwave, while “Apollo” offers a mournful melody, underpinned by Stewart’s communicative brush work. Band Menu is an epic outing by three gifted musicians playing to the jugular. 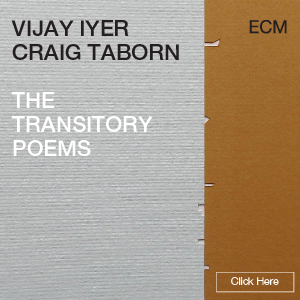 It’s a lesson in muscular improvisation from an exciting, state-of-the-art trio. 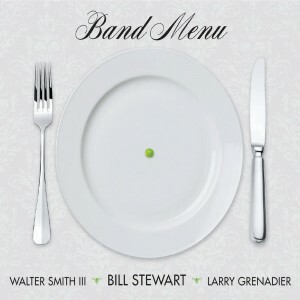 Personnel: Bill Stewart, drums; Walter Smith III, tenor saxophone; Larry Grenadier, bass.